But are you surprised? 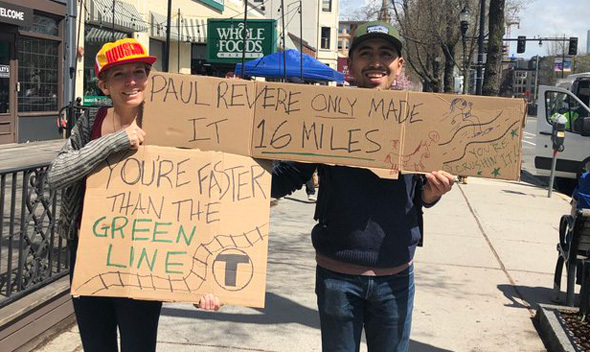 The Green Line riders lost whatever chance they might have had when, naturally, their train was taken out of service at Kenmore. 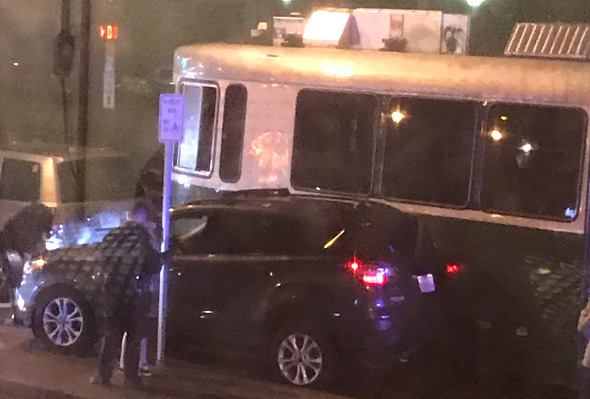 Danielle Jones shows us some of the carnage in Cleveland Circle where a trolley and several cars had a rather sharp disagreement over who should go where shortly before 8 p.m. Read more. Henry Wong shows us the SUV whose driver somehow managed to get the vehicle's wheels ensnared on the inbound tracks of the C Line near Englewood Avenue sometime after 6:30 p.m. The T reports it had to stop trains at Coolidge Corner and bring in some buses to get riders between there and Cleveland Circle. 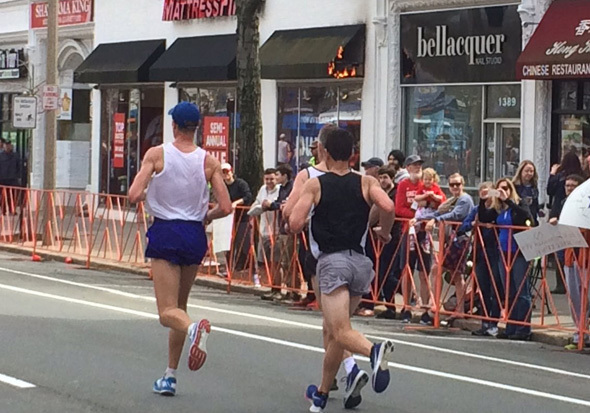 Patrick Maguire watched a turkey gang in action on Beacon Street this morning. 168 Beacon St. Photo by BFD. 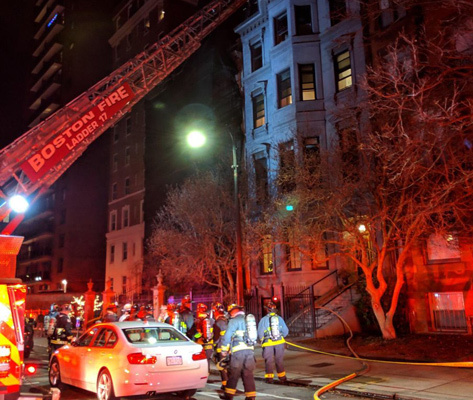 The Boston Fire Department reports a two-alarm fire caused an estimated $500,000 in damage to 168 Beacon St., between Berkeley and Clarendon streets. Read mroe. 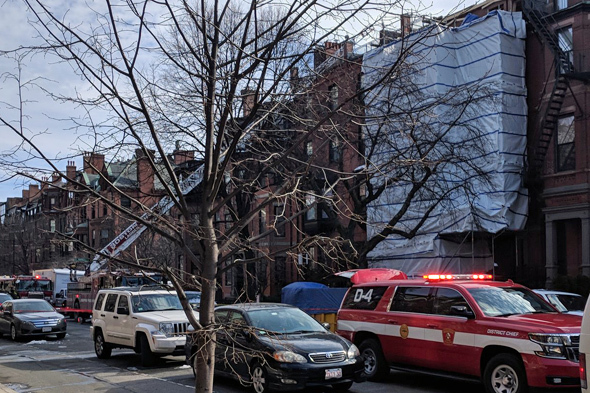 Kenmore Square was shut this morning for something found at 656 Beacon St., but was reopened after police determined the contents were not dangeous, WBUR reports. Pretty impressive turnout on the Common with just 24 hours notice. 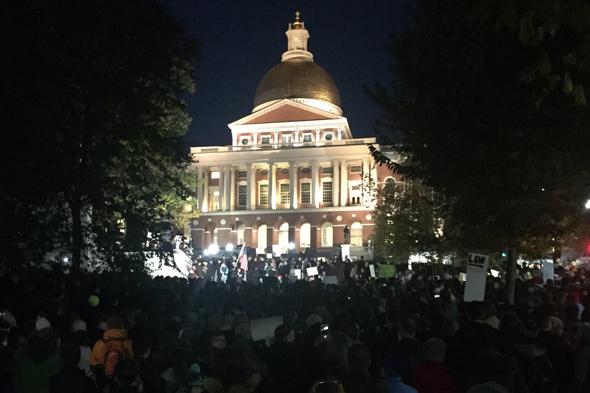 Lily Goldman is at a protest in Gloucester: Read more. Boston Police report arresting a man they say pointed a gun at another car around 7 p.m. yesterday at Beacon and Park streets. Read more. Reardon shows off plans on screen near the bar at the Brighton Elks. A company that is opening a medical-marijuana dispensary in East Boston said it has a purchase-and-sale agreement to buy BC dive Mary Ann's on Beacon Street and rebuild the decrepit place into a contemporary pot shop serving both recreational and medical marijuana users. Read more. The T is reporting delays of up to 25 minutes on the Green Line to and from Cleveland Circle due to a trolley there that remains stubbornly dead. 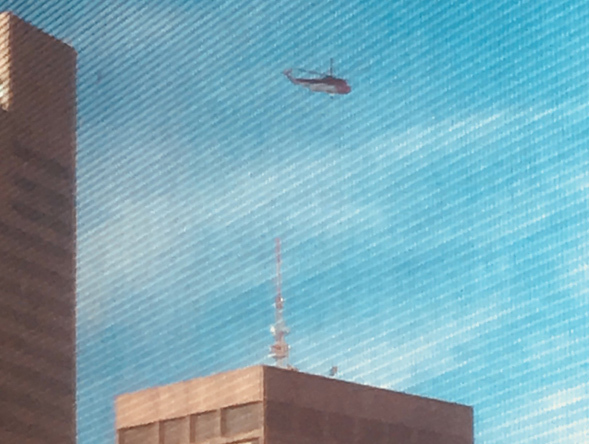 Seems Northeastern President Joseph Aoun lives on Beacon Street at Joy and protesters are trying to occupy it to protest a research contract ICE has with Northeastern. Beacon is currently shut between Joy and Park. Handmaids against Kavanagh will hold a vigil on Beacon Street outside the State House at 6:45 p.m. That'll then morph into an Everyone against Treason protest until 10 p.m. The FBI's Bank Robbery Task Force has posted photos of the man it says robbed the Santander Bank branch on Tremont Street at Beacon. Read more. Firefighters on scene. Photo by Kyle Stratis. Hours after a wrecking crew tore down a partially collapsed building in East Boston, the chimney of a building under renovation at 361 Beacon St. in the Back Bay collapsed and plunged to the first floor. Read more. Boston Duck Tours, Ltd. has agreed to a series of changes in the way it operates its lumbering vehicles in exchange for not having to face criminal charges related to the death of a woman on a scooter last year, the Suffolk County District Attorney's office reports. Read more.